Asia: Regular consolidations from Taiwan,Korea,Hong Kong, Shanghai, Nanjing, Ningbo, Beijing, Xiamen, Guangzhau and Japan. We offer 24-72 hours guaranteed door to door service from the above mentioned Far East gateways. Europe: Daily airfreight consolidations from France, Germany, Benelux, Italy and UK to IST. Twice a week airfreight consolidations from Spain and Portugal. We offer express airfreight services in addition to our regular consolidations. The above mentioned gateways are all within our 24 hours door to door service guarantee (except Spain and Portugal). North America: Regular consolidations ex Los Angeles, Phoenix, Dallas, Houston, Atlanta, Chicago, NewYork and Toronto. We offer order processing and distribution services throughout our North American network. Door to Door service: Door delivery service to/from France, Germany, Benelux, Spain, Portugal, UK, the Middle East and Korea within 24 hours. Autolog is a service network that has been established by PAN Logistics in 2000, to offer “Better Value Just in Time” for the Automotive industry. Autolog recognizes a global logistics culture that spans across country borders. The Autolog alliance has created unique service standards based on the expectations of the automotive sector: effective, flexible, cost controlled solutions. Autolog service network is located in Turkey ,France ,Eastern Europe, Balkan Countries, Austria, Spain, Portugal, Italy, Germany, UK, Brazil, Argentina, USA, Iran, Morocco, Tunisia, Japan, China, Korea, HKG. 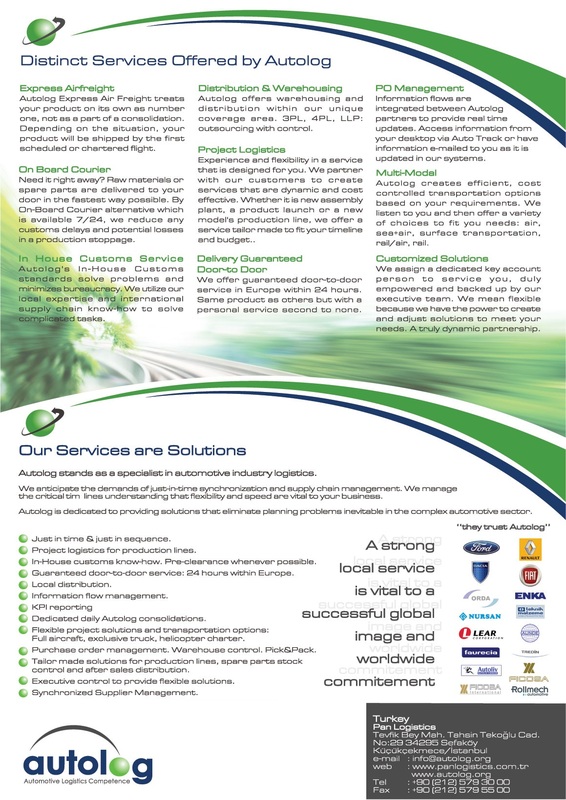 Autolog is dedicated to provide solutions that eliminate planning problems inevitable in the complex automotive sector. Flexible project solutions and transportation options: Full -part aircraft, exclusive truck, ro-ro, ro-mo, helicopter charter. Purchase order management, inventory control, pick & pack. After sales spare parts distributions. From small components to aircraft engines, we handle all routine, critical and AOG shipments. 24/7 on call service with our Aerospace Logistics Group partners. All our partners are specialized in the aerospace industry and are 24/7. Air-ride suspension trucks for engine transportation.